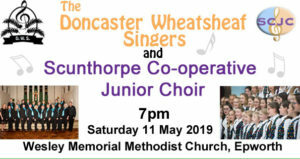 This promises to be a fantastic evening of music as for the first time the Doncaster Wheatsheaf Singers are joined by the Scunthorpe Co-operative Junior Choir. The choir will be singing several times throughout the wedding fayre and will have a stand with more information about the choir and our offering for weddings. A private concert for residents at the Chantry Country and Leisure Park.